Age Limit: Candidates age should be 18 to 27 years as on 01-08-2018. Age Relaxation: Age relaxation is applicable by 05 years for SC/ST, 03 years for OBC and 10 years for PwD candidates. For more relaxation in age please refer the notifications. Education Qualification: Candidates should have passed senior secondary or its equivalent exam from a recognized board or university for post 1&2, 12th standard in non-medical stream from a recognized board or university. Selection Process: Candidates will be selected on the basis of Computer Based Exam, Descriptive Test, Skill Test & Interview. How To Apply: Interested & Eligible Candidates can apply online through www.ssconline.nic.in from 18-11-2017 to 18-12-2017 by 05:00 pm. 2. See the Section CHSL and Click on "Click Here to Apply". Last Date to Apply - 18/12/2017 by 05:00 pm. Last date for payment of fee through SBI Challan(Offline) - 20/12/2017 by 05:00 pm. The Staff Selection Commission (SSC) was founded on 4th November 1975. 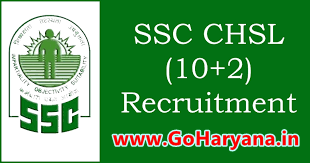 We provide information about SSC Recruitment 2018. The Headquarter of the SSC is located in New Delhi, India.